I enjoyed Nick’s post yesterday about some copywriting techniques that work … until they don’t. And I’m glad he spoke to the danger in trying to blindly follow what we think of as copywriting “formulas” without putting the homework in. Because we can create images, emotional states, and even money and freedom, seemingly out of nothing. But we don’t really conjure great copy and content like a Patronus from the tip of a magic wand. Effective writing comes from a very specific kind of homework. From empathetic listening. From spending time with the kinds of folks who make up our audience, and striving to see the world through their eyes. I don’t mind copywriting formulas at all. They’re wonderfully handy cheat-sheets, so we can remember to include important persuasive elements. But formulas are just the beginning. We can’t bring them to life until we understand the person we’re communicating with. Here are some ways to learn much more about the audience you’re serving with your work. #1: Why do you care about their problem? 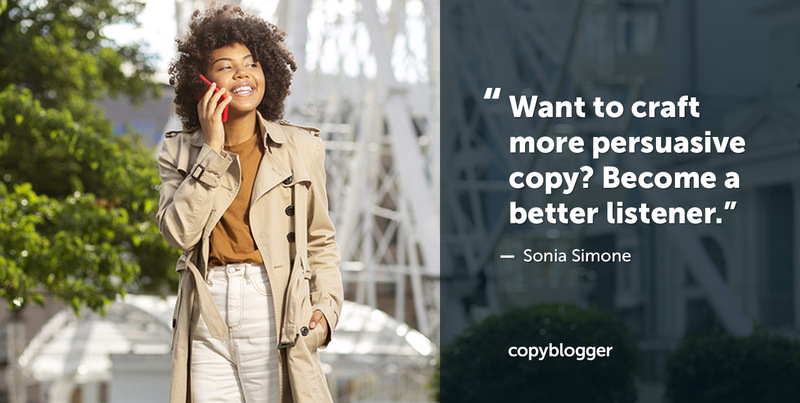 Good content and copy need to solve audience problems. The world is full of people with problems and concerns … what is it about this one that tugs at you? You might have experienced the problem yourself. Someone you love might have wrestled with it. Or maybe you’ve spent years working with clients, and have felt the pain of their initial starting place, and the triumph of resolving the problem. It’s hard to create emotionally resonant work if you can’t get to a place where you can feel the weight of that audience problem. #2: What does the map look like? The well-known empathy mapping exercise challenges us to understand what our audiences are seeing, thinking, doing, and feeling. What kind of map can you create that will allow you to fully feel the emotions and experiences of the people you help? Text is a wonderful thing (it’s what our magic is made of, after all). But you may find that you also want to pull together imagery and other multi-sensory material to help you get into the right frame of mind. Is there a film you could watch that would help you explore that emotional territory? A landscape or cityscape you could find on Google and print out for your reference? What is the soundtrack to this set of experiences? You can use existing tools like empathy mapping, but you’ll form a more vivid picture if you add your own processes and techniques for understanding your audience. The more you can immerse yourself in the emotional world of this person’s struggles and challenges, the better your copy will be. #3: Where are they talking? I’m a big fan of strategic lurking. Where are the folks you intend to serve? Are they Facebook people? LinkedIn folks? Maybe Pinterest or Instagram dwellers? For the most part, you can avoid learning all about this week’s “hot new” platform. Once in a great while, the next Twitter comes along. Almost always, it’s the next Ello. Platforms don’t matter. People matter. So find out where your people like to hang out, even if it’s still MySpace. I like to call this kind of research complaint mining. You’re looking for where people are groaning and moaning about their problems, and the existing solutions, your competitors, and possibly … you. Your job is to shut up and listen. Stay open to all of the ways that folks are talking about meaningful problems — including the ways that challenge your preconceptions. You’re looking for audience problems, yes, but you’re also looking for the specific language they use to talk about those problems. If your copy promotes a new gluten-free baked good, look for how people are complaining about what exists today. The words gummy, bland, chalky, gritty, and probably inedible should feature in your copy somewhere, as you paint the sad picture of what exists today. Pro tip: If the gluten-free baked good you’re writing about isn’t actually delicious, look for another gig. As quickly as you can. Great marketing for a crappy product just gets the word out faster about how crappy you are. #4: Who is this person? Brian and I both like to craft our “avatar” into a lively, believable person, in the same way that a novelist or screenwriter crafts a fictional character. Just like a good novelist, a good copywriter knows a lot more about her characters than she ever reveals on the page. What’s your avatar like? What kind of car does he drive? What kind of music does he like? Does he like sushi? Travel? Parties? Other people’s kids? Which actor would play your avatar in the biopic? What would the soundtrack sound like? You don’t have to try to weave extraneous details into your copy. (In fact, that’s probably a horrible idea.) But they’re there so that this person feels real to you. In the same way that Hermione Granger or Severus Snape do. When the character feels as real to you as your favorite character from a film or a novel, you’ve got it. #5: So … what are we drinking? Once your character is fleshed out, based on your listening and empathy exercises, it’s time to take them out for a drink. A Bud Light? Or maybe a craft beer would be a more suitable choice? A porcelain cup of jasmine tea? Tequila shots? A green smoothie? Picture yourself sitting down across a table with your new friend and just having a chat about your topic. About possible solutions and opportunities. About the next steps that you think will help them move to something better. All of your copy should be written this way — one to one, across a table, over their beverage of choice. Not like the Pope at the balcony over St. Peter’s Square. Not one-to-zillions. What are your favorite ways to really understand your audience? Thanks for the mention of my post… and I love this piece as a deep dive into the value of listening. Like you say, if you don’t go through a listening process, get to know your reader, and care about that reader… then all you’re doing is writing by numbers. You’re joining together a bunch of tips and techniques in the hope that the end result will approximate “copywriting’. Listening comes first. And listening and caring combined is best of all. What a nice way to think about it. 🙂 Thanks, Kara! Nice post Sonia. I always tell our copywriters to empathise with their readers. Your points are really well written and I’ll be passing this blog on to our team. Thanks again!